Actually WHAT REALLY HAPPENED is my man Tom Elko headed down to a noontime presser at Coleman HQ in St. Paul. Yeah, we don't have much time for it either. I'm sure we're quite the joke down at the Coleman HQ. Heck, we're quite the joke down at The UpTake HQ. (Come to our fundraiser, for $100 we'll have you thrown out of a political event of your choosing!) Still, this was the third time we'd been kicked out and I wanted to do something. A bit too dramatic? A stunt? Maybe, but it felt right. 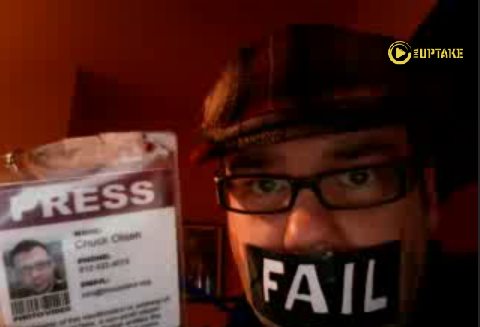 I had a live "press conference" of my own, but I was muzzled. I put up various messages like "The UpTake Muzzled - This could have been live Coleman coverage" while playing other clips of us getting kicked out, along with interview footage with Prof. Jane Kirtley saying that sort of behavior has not held up in the courts. 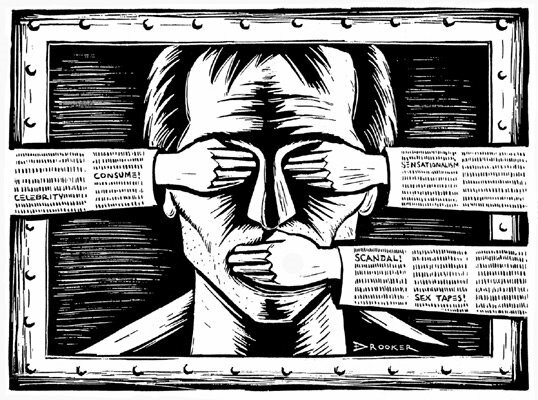 I started editing more press freedom-related clips as I silently protested, and tossed them into rotation. It was sort of improv political theater protest - yeah, something as pretentious as that I'm afraid. People noticed, though, which was the point. MNspeak, Greg Swan, Minnesota Independent, and Digital Journal – and a bunch of other cool people on the twitters and stuff – you guys rock and I kiss your butts hard.